Body of Vision (University of Toronto Press, 2013) reconsiders fundamentals of Northrop Frye’s theories of meaning, literature, and culture in the light of related current approaches that have taken his insights in very different directions. It develops branches of Frye’s thinking by proposing partial syntheses of them with cognitive poetics and with contextualist theories of cultural history and ideology, seeking to retain the best of all worlds. Case studies of texts and genres work out promising connections in detail.Three related aspects of Frye’s work are explored: meaning and thought, culture and society, and literary history. Chapter 1 connects Frye’s theory of meaning and poetic metaphor with those developed in cognitive linguistics and poetics by George Lakoff, Mark Johnson, and Mark Turner. Chapter 2 applies this synthesis to the metaphoric world of Dante’s *Divine Comedy*. Chapter 3 links Frye’s approach to the relations among literature, society, and ideology with that of cultural theorists Roland Barthes and Stuart Hall, and with Lakoff’s cognitive account of metaphor and framing in political thought and discourse. It characterizes the contrasting conservative and liberal worldviews represented in Hobbes’s Leviathan and Rousseau’s Social Contract. Chapter 4 considers relations between general principles of literary cognition and particulars of texts and contexts in history. Frye’s approach is compared with Patrick Colm Hogan’s study ofemotional and literary universals, and with the new historicism of Stephen Greenblatt and Louis Adrian Montrose. The pastoral is examined as a genre that appears decidedly dated in many ways, yet is still capable of communicating powerfully. I do not think of the Anatomy as primarily systematic: I think of it rather as schematic. The reason it is schematic is that poetic thinking is schematic. The structure of images that C. S. Lewis in The Discarded Image calls “the Model” was a projected schematic construct which provided the main organization for literature down to the Renaissance: it modulated into less projected forms after Newton’s time, but it did not lose its central place in literature. Our first imaginary conversation proposes to reveal important parallels between Frye’s literary and cultural theory, on the one hand, and cognitive literary studies, on the other, which make it worthwhile to look at these theories in each others’ lights, so to speak. The most important parallels concern the relation of metaphors to one another and to the larger mental models giving structure to culture, literature, philosophy, science, and moral and political worldviews and ideology. Determining their points of agreement and divergence can indicate how they may be developed in concert, as supplementing, extending, and correcting one another’s claims and arguments about common concerns. From this vantage, I see Frye as elaborating some of the broader cultural implications of the conceptual approach to meaning, and the conceptual party as able to support certain versions of Frye’s theses about literature and culture by articulating the linguistic and conceptual details. (Putting them together, as I’ve suggested, we get more of the forest and more of the trees than we could with either one alone.) After a brief overview of some common aims, principles, and background, this chapter turns to detailed discussions of the former, then the latter. The ultimate aim is to describe in detail the possible forms of coherence across metaphors and their imagistic structures. This will prepare the ground for a study of metaphoric coherence in what Frye calls “literary cosmologies”, which are metaphoric storyworlds. To clarify, storyworlds, as David Herman defines them, are “mental models of who did what to and with whom, when, where, why, and in what fashion in the world to which recipients relocate [. . .] as they work to comprehend a narrative” (Story Logic 5). Literary cosmologies are metaphoric storyworlds in that they are structured by compounds of metaphors (i.e. many aspects of the storyworld are metaphorical, and as they interact with one another, the metaphors combine). The next chapter will use this chapter’s analysis to examine the metaphoric coherence of the cosmology of Dante’s Divine Comedy. The chapters following connect the cosmology to social mythology and to literary history. The approach to figurative language and thought pioneered by George Lakoff, Mark Johnson and Mark Turner caught imaginations across the world, and I think it’s no exaggeration to call it revolutionary. At present it constitutes a flourishing research program that continues to invigorate many fields. It has roots in cognitive linguistics, which is also highly interdisciplinary, and claims a very broad scope, examining metaphor, figures, and narrative in many areas, including literature, philosophy, religion, anthropology, politics, mathematics, and particularly worldview and common sense. As with Frye, there is an impressive interdisciplinarity of sources and influences. Cognitive literary studies encompasses cognitive poetics, narratology, rhetoric, reader response, and more. Indeed, it may draw on any of the fields associated with cognitive science—not only linguistics but cognitive psychology, anthropology, and various divisions of neuroscience. In fact, reception of the two theories is also comparable and can lead us into some of their common aims and assumptions. Early views of Frye tend toward hagiography or hatchet job, and the gamut remains narrow and polarized. In short, while many find Frye’s ingenious analyses, analogies, synopses and pattern perception highly informative, others find them over-ingenious and over-idealized. Discounting genial praise, general abuse, and frequent misunderstanding, Hamilton sees in serious critiques of Frye chiefly a distrust of his systematicity, a concern that abstraction away from contextualized particulars can be flattening of textual complexity and literary experience, and rejection of his totalizing ambitions (Anatomy 4-6). Dolzani notes the standard complaint of reductivism, and says that during the fifties and sixties Frye was attacked for being unscientific—not proving his patterns empirically there—and during the seventies and eighties for misinterpreting empirical findings—we easily find patterns because we are conditioned to do so. In the nineties sociological critique asks who decides on and interprets universals, and on what authority? (“Wrestling” 98). Cognitive critics are also oriented towards form and structure, general principles, and universals, and Lakoff and Turner and others have also been accused, in similar terms, of overstating their claims and simplifying their topics: reducing specifics to abstractions, flattening meaning and emotion, downplaying cultural and historical context, insufficiently distinguishing literal from figurative. Without going into great detail, we can fashion one response for both: reductionism need not follow. Neither theory purports to explain everything about particular texts. Both address a clear need for larger perspectives by creating frameworks capable of bringing together arrays of related phenomena. Fine-grained facts may be the most immediately evident to the senses, especially with art, which trains and rewards heightened sensitivity to nuance. But they are not the only facts, and they do not vitiate the need to address those of larger, coarser grain. Indeed, if Frye and the conceptual party are right about the importance of conceptual systematicity (or schematicity) in the creation of resonance for myth and metaphor, then their theories offer an explanation for some of the most powerful, and most specifically artistic effects of literature—an explanation of a kind that is unavailable to the scrutineer of surfaces. 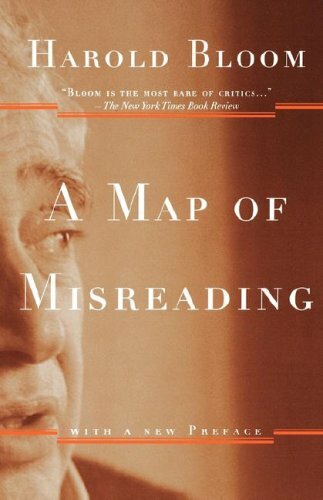 As Frye puts it, “Many who consider the structure of my view of literature repellent find useful parenthetic insights in me, but the insights would not be there unless the structure were there too” (“Reflections” 145). The business I envision for this chapter, then, is using Frye’s literary theory to conjoin two kinds of “cognitive criticism” deliberately oriented to explanations that make essential but not greedily reductive use of cognitive research. On the one hand there is the kind represented by Mark Turner (Reading), David Bordwell (“Case”, “Contemporary”) and Noël Carroll (“Prospects”), who demur from both isolated textual “readings” and sweeping self-ratifying annexations of texts and theories by “grand theory”, to focus on “middle-level” topics and problems specific to the arts. These critics aim to describe the commonplace background knowledge of readers and viewers, and explain how it underpins readers’ experience and interpretation of texts and films. On the other hand, there is the kind represented by Reuven Tsur, who distinguishes cognitive poetics from cognitive linguistics by the former’s focus on explaining specifically poetic “effects” (“Aspects” 279-81). Yeshayahu Shen (“Cognitive Constraints”, “Metaphor”) makes a related distinction between approaches to the nature of poetic (especially figurative) structures. Against the various approaches that highlight the creativity and novelty of poetic discourse, his approach highlights the need of such discourse to conform to cognitive constraints, in order to be communicable. Poetic discourse must both conform to, and interfere with, cognitive processes (cf. Semino and Steen). Indeed, for Ray Gibbs Jr. the “paradox of metaphor” everywhere, not just in literature, is that it is “creative, novel, culturally sensitive, and allows us to transcend the mundane while also being rooted in pervasive patterns of bodily experience common to all people” (“Metaphor” 5). As I hope to show, Frye’s approach examines the special structures and processes specific to literature, but he does so by comparing and contrasting that literary cognition with non-literary cognition. 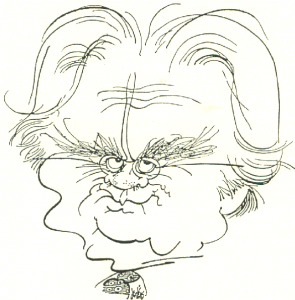 This entry was posted in Literary Criticism on September 4, 2012 by Joseph Adamson. Further to Jonathan Allan’s response to my earlier post, I’d like to clarify that I didn’t mean to imply that Bloom is wrong to have preferences, or wrong about the selections for his poetry anthology. I only intended to rebut Bloom’s erroneous claim – which he has repeated many times – that Frye was against value judgments. He wasn’t. Frye made no secret of the fact that he considered Blake the greatest English language poet of his generation, and one of the greatest of all poets. That’s an overt value judgment, and Frye made no effort to conceal it. Bloom is entitled to like or dislike whatever he chooses. But it is unfair that he keeps repeating false claims about Frye. His hostility appears to have grown over time, and he seems to mention Frye frequently in interviews these days, but always misleadingly and always entirely to Frye’s detriment. Frye’s point about value judgments is that any attempt to approach literary criticism based upon them is a dead-end. I love Shakespeare, but Bloom’s incessant bleat about Shakespeare’s supremacy over all other writers gets in the way of his ability to say anything fresh about the plays. And the assertion is unproveable. What does Bloom’s assessment even mean? Is it really the case that Shakespeare was wiser and smarter than all other writers in all ways? Bloom is entitled to his opinion, but what good does it do to hammer away at this point? And what if he’s wrong? It might seem foolhardy to question the supremacy of Shakespeare, yet surely there are crucial ways in which someone like Chekhov, for example, could be considered a greater artist. Nobody ever spoke the way Hamlet speaks. Chekhov’s greater mimetic realism makes him, in some crucial ways, more accessible, just as Vermeer’s or Rembrandt’s paintings are in some ways more accessible than Michelangelo’s titanic renditions. Yet this is the sort of thing Bloom doesn’t even like to think about. Artists are constantly being ranked: Shakespeare is #1, Dante is #2, Joyce is #3. . . It is silly and pointless. Recently, he declared Beckett the greatest English language writer of the 20th century, surpassing Conrad, Woolf, Lawrence. How is Beckett “better” than Conrad? They deal with different aspects of existence and illuminate different experiences of life. Where do we go next with this sort of critical criteria? Are we going to declare Mozart superior to Beethoven and Bach? Or maybe it is Bach who’s the supreme musical genius. But then again, it must be Beethoven because of the symphonies. It is always possible to play this parlor game, but it can only remain a parlor game. This entry was posted in Literary Criticism on November 25, 2011 by Guest Blogger. 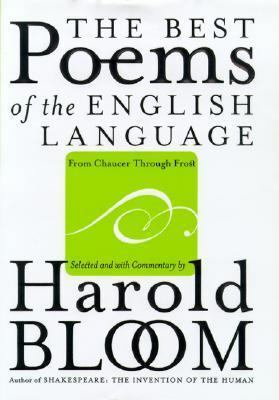 In Bloom’s introduction to The Best Poems of the English Language, he states, “this vast book is intended for every kind of personal use” (his emphasis). He later on the same page says: “Essentially, this is the anthology I’ve always wanted to possess. It reflects sixty years of deep and passionate reading, going back to my love of William Blake, Hart Crane, and of William Shakespeare and John Milton, that vitalized my life from my twelfth year onward.” This book is very much about Bloom and he admits as much on the first page of his introduction. One of the few gains from aging, at least for a critic of poetry, is that taste matures even as knowledge increases. As a younger critic, I tended to give my heart to the poetry of the Romantic tradition, doubtless spurred to polemics on its behalf by the distortions it suffered at the hands of T. S. Eliot and his New Critical academic followers: R. P. Blackmur, Allen Tate, Cleanth Brooks, W. K. Wimsatt among them. In my early seventies, I remain profoundly attached to the sequence that goes from Spenser through Milton on to the High Romantics (Blake, Wordsworth, Shelley, Keats) and then on to the continuators in Tennyson, Browning, Whitman, Dickinson, Yeats, Stevens, Lawrence, Hart Crane. With Chaucer and Shakespeare, these remain the poets I love best, but maturation has brought an almost equal regard for the tradition of Wit: Donne, Ben Jonson, Marvell, Dryden, Pope, Byron, and such modern descendants as Auden and Eliot (a secret Romantic, however). Bloom is speaking about Bloom and for Bloom — his ideas and preferences have changed over time. The exegetical work that follows is Bloomian to be certain, but what else could we expect? Literary critics — all of us, I imagine — make value judgments about literature. We make these judgments when we decide what to teach and what not to teach. Having just returned from a conference on the popular romance novel and pedagogy, I am keenly aware of the fact that when we design a syllabus, we are, in a sense, canonizing authors/texts (at least within the context of our seminar rooms and lecture halls). Even in teaching miserable texts and calling them miserable texts, we are acknowledging that there is some value in studying the text (likely to show students what a bad text does that good texts don’t do). The solution, I suppose, is that we could discard all value judgments, but I’m all too certain that the subjectivity of the reader will come out, we will decide if we like a text or not, we will call it good or bad. All readings are deeply personal, and that is precisely the point. I don’t think Bloom denies “blind spots,” actually it seems he recognized that he had them and has matured with age. We all have “blind spots,” and that is, as Michael notes, Frye’s point — and Frye certainly had blind spots as well. All literary critics do. Bloom is at his most polemical in The Western Canon but, I think, if we read it closely, Bloom’s argument is less with a canon and more with an argument against cant, against the School of Resentment, and so on. He is frustrated that the text has been lost to ideological theorizations of texts. Now, that is yet another value judgment and some of us may agree that we should discard theory altogether, and others will want more of Derrida, Butler, Spivak, Foucault, and so on. The point of all of this, if there must be one, I suppose, is that the literary experience is deeply subjective. This deep subjectivity is perhaps what makes the institutionalization of literature so problematic. How do we position literature in the academy and still maintain the academy’s faith in literature as an area of study? If literature is deeply personal, deeply subjective, how then can it be studied in an institutional setting? What is the role of the institution in the study of literature? This entry was posted in Literary Criticism on November 20, 2011 by Jonathan Allan. The Centre for Comparative Literature is, in a sense, the centre for theory; at least this is the image that the Centre presents for itself. Theory is essential to Comparative Literature. 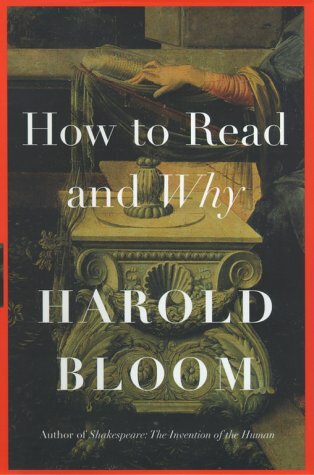 But, what does the scholar do who prefers not to read Derrida and instead prefers Bloom (Harold or Allan)? Or, how does one approach Northrop Frye at the Centre (after all, to date, only two or three “Frygians” have held the Visiting Professorship: Alvin Lee and Jonathan Hart, and, though to a lesser degree—less declared more influenced—David Damrosch)? Theorists, writers, critics like Harold Bloom, Northrop Frye, Frank Kermode, Stanley Fish, M. H. Abrams, William Empson, canonical voices in their time, are now part of a time gone by. These masterful critics, for they all were and are masterful, are no longer a part of the mainstream of literary theory and criticism. So what does the scholar of today do if that scholar is riddled by the anxiety of admitting that he or she finds people like Frye, or the Blooms, or Abrams, or Empson more engaging and more productive to his or her literary pursuits than the voices of “high” theory? As much as I appreciate the critiques of Harold Bloom that are often enough advanced on this site, I have to reluctantly admit that I hear similar critiques aimed at Northrop Frye. Are these critiques true? Probably not. But they are common enough that we are reminded over and over again of Terry Eagleton’s infamous question: “Who now reads Frye?” The question, perhaps, contains the answer. 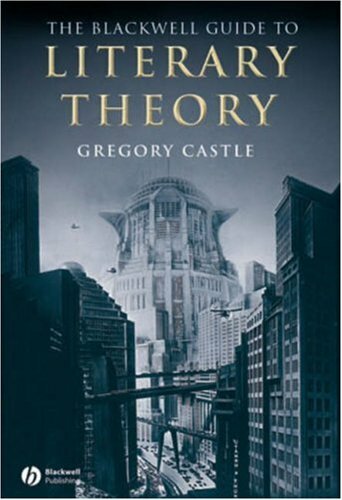 Those of us who read theory, read what is “now” called theory, if we read Frye we are not reading the “now” of theory, which is to say, we are not reading what is now available, now considered au courant. The theorists that I most often turn to are hopelessly not part of the “now” of theory; instead, they are part of a generation once removed, their time in the “now” was before the rise of theory, before the theory boom, before the Centre for Comparative Literature. Indeed, the scholar’s anxiety is probably a balance between reading enough of the now to appear cognizant of what is going on in the world of literary theory and reading enough to satisfy the reader’s search for a theoretical approach that works and still resides in the literary. This entry was posted in Frye & Contemporary Criticism, Literary Criticism on September 5, 2011 by Jonathan Allan. 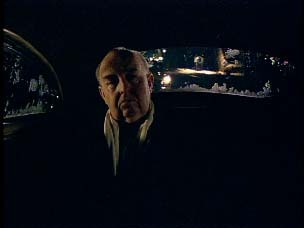 The reason Bloom, in this interview, does not mention Frye in his list of “my greatest influences” is that Frye’s influence ended when Bloom had a nervous breakdown and began to write nonsense after deciding that literature was primarily “based upon agonistic competition,” as he puts it in the interview. It is all about the Oedipus complex and castration anxiety. It is all about which writers are greater, stronger, more powerful than others: in other words, which writers Bloom identifies with, and which ones he dismisses. His judgment of Poe is a perfect instance (see his attack on Poe in the New York Review of Books, “Inescapable Poe”): “Poe’s survival raises perpetually the issue whether literary merit and canonical status necessarily go together. 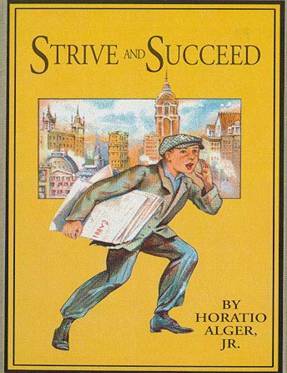 I can think of no other American writer, down to this moment, at once so inescapable and so dubious.” He ridicules, for example, the overwrought prose style of the narrators in Poe’s great tales, a style that is in fact carefully attuned to the states of mind of the characters, who are often criminally insane or on the threshold of consciousness. It is as if a critic were to ridicule Mark Twain’s prose style in The Adventures of Huckleberry Finn because the narrator writes ungrammatically and uses cuss words. In contrast, Frye regarded Poe as a literary genius. I do not give in to political considerations, however they mask themselves. All this business about gender, social class, sexual orientation and skin pigmentation is nonsense. I’m 81. I’m not prepared to temporise any more. I’ve been prophesying like Jeremiah since 1968, warning the profession that it was destroying itself. And it has. It is interesting that Bloom began his jeremiad around the same time he broke with Frye. That’s over forty years, I guess, of not temporising. But this harangue is no better than Lynne Cheney (“not for me”) and Alan Bloom in the Closing of the American Mind. It is the tedious and angry voice of a reactionary. Frye was certainly concerned about the ascendency of ideological criticism but he countered it with a defence of the liberality and autonomy of imaginative culture. He did not speak contemptuously (“all this business about gender, etc.”), and he never whined and railed. He did not dismiss other people’s genuine concerns, even when he thought they were misguided; he tried to engage them, with as much graciousness as possible. And then there is Bloom’s vanity, transparent throughout, and the maudlin sentiment, the name-dropping, the emphasis on close “personal” friends (“Those are the five books. Four of them are by personal friends, and one is by someone I corresponded with.”), the nauseating idolatry of genius, and the wheedling allusions to the enormous number of enormous books he has written, one volume after another dedicated to the memory of his own opinions. Criticism founded on comparative values falls into two main divisions, according to where the work of art is regarded as a product or as a possession. The former develops biographical criticism, which relates the work of art primarily to the man who wrote it. . . . Biographical criticism concerns itself largely with comparative questions of greatness and personal authority. It regards the poem as the oratory of its creator, and it feels most secure when it knows of a definite, and preferably heroic, personality behind the poetry. If it cannot find such a personalty, it may try to project one of out of rhetorical ectoplasm, as Carlyle does in his essay on Shakespeare as a ‘heroic’ poet. This entry was posted in Frye & Contemporary Criticism, Frye and Contemporary Scholarship, Literary Criticism, Literary Scholarship on September 2, 2011 by Joseph Adamson. I think this is a debate that is needed, but at the same time, I appreciate and enjoy literary theory. Whenever I hear the “death of the discipline,” I always, for one reason or another, feel a need to rebel. I don’t think it is “theory” that killed literary studies or devalued literary studies, and yet, I am not certain what is the cause of this devaluation. The problem with the term “literary theory,” is that it has come to mean anything but literary theory: what passes as literary theory is sociology, or linguistic theory, or psychoanalytic theory, or history, or queer theory, feminist theory, even evolutionary theory now, as Scott Herring alludes to in his article. None of this is, properly speaking, literary theory, which would be a theory of literature as an imaginative form of communication that is distinct from other uses of language. This is all laid out in the opening chapters of Words with Power, where Frye distinguishes the logical, descriptive, and rhetorical uses of language from “mythological” or “imaginative” uses of words. The same goes for the term “critical theory,” which is not in its current use a theory of (literary) criticism at all. 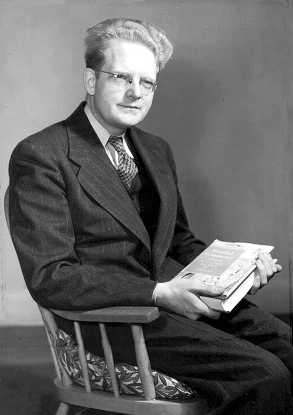 The latter can only be, according to Frye, a theory concerning the principles of literary criticism, the contexts of which he attempts to outline in Anatomy of Criticism: historical criticism (theory of modes), ethical criticism (theory of symbols), archetypal criticism (theory of myths), rhetorical criticism (theory of genres). What Lynne Cheney and the radical left (as it has manifested itself in literary studies) have in common is an ideological bias that cares little for literature as an autonomous activity of imaginative recreation, as Frye understands it. By “autonomous,” Frye does not mean that literature is “pure” of historical or ideological content, but that what most matters in literature is the imaginative shaping of that content. This aspect is also the genuinely “critical” aspect of literature that gives it its authority and has the power to remind us of how far, how grotesquely the world we have created departs from a world that makes human sense. In that light, I do think we can speak of a deterioration, if not the death, of a discipline, when so many of its practitioners are seduced and distracted by principles belonging to other academic or scholarly disciplines than its own, and especially when the approach subordinates the study of literature and culture to socially and politically activist agendas, right or left. 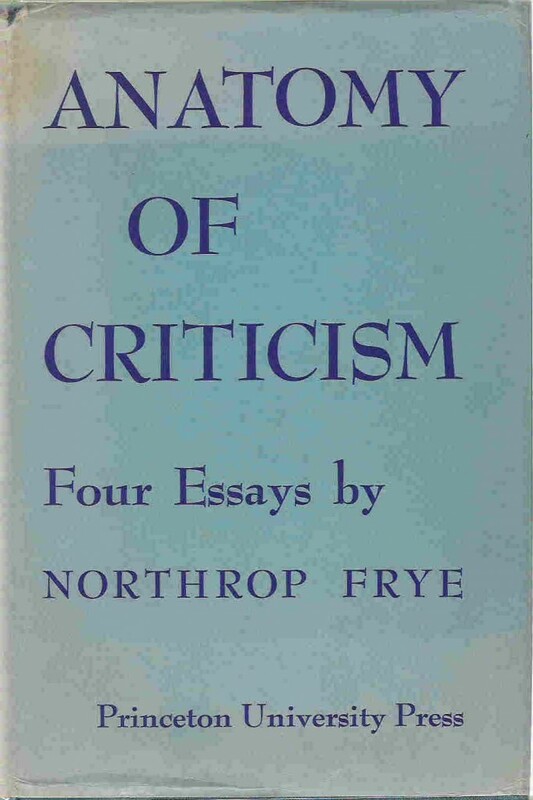 It is in fact in pursuing his theory of literature and criticism as an autonomous activity and discipline that Frye came to produce at the same time cultural and social criticism of a very high order–not because he turned for his insights to the worlds of sociology and history. This entry was posted in Anatomy of Criticism, Literary Criticism, Words with Power on August 30, 2011 by Joseph Adamson. This entry was posted in Bob Denham, Literary Criticism, Quote of the Day on February 14, 2011 by Bob Denham. This entry was posted in Birthdays, Literary Criticism on January 13, 2011 by Michael Happy. 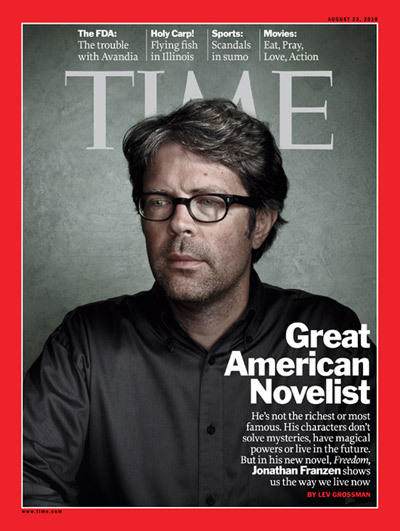 A recent phenomena relating to the invariably glowing reviews that Jonathan Franzen gets in publications like the New York Times at the expense of “popular fiction,” especially that written by women, reported here and here. This entry was posted in Current Events, Literary Criticism, Popular Culture on September 3, 2010 by Jonathan Allan. IS: Why was Frye, as well as the subsequent theoretical modes that have originated in America and France, rejected by British critics? Why are they so resistant to theoretical criticism? This entry was posted in Literary Criticism on August 18, 2010 by Michael Happy.